Chicken Fat: HAPPY BIRTHDAY UGA!! On this day in history in 1785 the first US state university was chartered in Athens, Georgia. It was originally named something else, which I don’t remember, but in time it changed its name to The University of Georgia, or for short UGA. My great-great grandfather Eugene Hargraves Tyson (1798-1868) graduated from there. I read that he was a Latin scholar. I speculate he was a student there about 1820 when the University was about 35 years old. He holds the unique position in my genealogy carts as being the first common ancestor that Anna and I both have – although, he is her great-great-great grandfather…. We did not discover this until I got into genealogy research. Eugene Hargraves Tyson did like many UGA students do today. After he graduated he stuck around Athens. He was a tax collector. I have seen his ledger book of his collections. Eugene married Frances Eliza Portress Herring. In 1832 or 1833 he gained land in Cherokee County, Georgia, by means of the Georgia Gold Lottery. His gold mining operation was on Kellogg Creek, just northwest of Woodstock, Georgia. I have a son Rockwell T. Hunter, who also graduated from UGA. His middle name is Tyson. It all makes sense now doesn’t it? 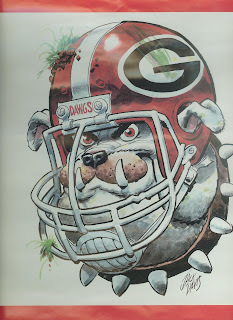 UGA I believe was called Franklin College. I even thought of Franklin College when I was trying to recall the name, then I said (to myself), "Naw, Franklin sounds what they would name it if they lived within the boundaries of the proposed state of Franklin, which I think was western North Carolina and eastern Tennessee." Fascinating. Always like this stuff and wish I knew more about my forebears. Forebears are better than forehippopotamuses. Or fivehippopotamuses. And I think it is important to carry down family names. After all, we carry down a lot more than just names. My Grandfather was Silas Clark Daugherty, Sr. I am SCD IV and my son is SCD V.
I am Edwin Tyson Hunter, Jr.
And the John that wrote the first comment on the post is John Hunter the 3rd, and his seven year and seven day son, is John Hunter the 4th. While typing the previous comment I forgot to make my point. John's grandfather was probably named after his father's brother John Hunter. I need to stay away from making long sentences... I forget my point before I get there! Correction notice. John IV is now 8 years and 4 days. Darn! I know. As soon as I clicked send I thought to myself, "Wait! It is 2009, not 2008!" But it was too late. I can't explain the days mix-up - my fingers got confused. We went to hear a lecture by Joe Kirby tonight and his book about the Bomber Plant. And goats are better than bulldogs - or asses.